The Mukwonago Logo fight, where a unit of local government in Wisconsin is openly and willfully defying the State of Wisconsin and the rule of law as contained in State Statutes enacted by the Wisconsin State Legislature in 2010 that makes it unlawful for school districts with Indian nicknames, mascots or logos that are determined to be racially based to retain them as in Mukwonago is linked to the status, perception, and treatment of Wisconsin Indian Tribes and their peoples in the here and now. It also is strongly linked to the fight to preserve a 71-mile-long river system and the drainage into the nearly pristine Lake Superior that is at stake in the Penokee Hills Mine. In both instances how the dominant Euro-American culture perceives its Native-American brothers and sisters is the inciting dynamic. And that dynamic is based on racial stereotypes that are candidly racist. The rhetorical backdrop to both problems is based on conceptions about race in America that are hateful and counterproductive to the progress of our nation. Struggles for Justice and its editor have been the object of comments that are veiled racial prejudice and others are openly so. Still others display the classic stereotypical misperceptions of a whole people. For example, one respondent felt that Native-Americans were no more than a group of drunkards who gamble a lot and are not worth taking seriously. Now, that part of the Mukwonago community that stands with the School Board’s defiance of the rule of law itself not to mention so much else is having a racial temper tantrum. The anger displayed in Mukwonago has flamed up into open racial animus. It is very sad. Chief Joseph would counsel all of us to open our hearts. But when individuals cannot do this or will not do this we are all damaged by it. Barb Munson has been fighting for social justice all of her life. She notes correctly that when you racially stereotype people you marginalize them and their voice in the counsels of all the peoples that make up the United States of America. It is more difficult to solve problems together. The ability to see each other as brothers and sisters of this Earth with an equal claim to be heard and to be cared for, one with the other, is the most powerful tool, nay even weapon, we can wield for social justice. What is happening with the Wisconsin legislature and the mining companies in the Penokee Hills policy discussion, and what is occurring among proponents of the Mukwonago Indian nickname and logo is an antisocial recognition that this power to open our hearts spoken of by that wise elder Chief Joseph is weighing heavily upon their very consciences and souls. Yet those parts of these people have yet to exhibit the strength to pry open their hearts and to reach out in brotherhood and sisterhood and equality to Native-American members of our common humanity but also that political community that is the United States of America. The mine proponents, the Mukwonago Indian nickname and logo proponents are linked in that their ability to love one another and to treat others as they would wish to be treated is stunted and underdeveloped in them. They are to be pitied and not hated for this. Nor should we hold them up as models for the rest of us to emulate. In the Penokee Hills Mine Project you also have the human sin of greed entering in to things. For a small extraction of taconite ore in the region for monetary gain, and producing relatively few jobs for Wisconsin citizens, mine proponents are willing to pollute and destroy what is some of the most pristine waterways in Wisconsin and to threaten the condition of Lake Superior into which the soon to be taconite laden waterways of the Penokee Hill region river system will drain into such a lovely lake. A Lakota Sioux historian of this century and time has noted that the Euro-American conception of America when they arrived was that they saw it all as wilderness. Its very openness was something to be filled with Western Civilization’s trappings before it could be perfected. Native-American cultures do exploit the lands, air and waters but they continue to be better stewards. They know they and the land are all part of something greater then themselves. It was the Creator’s world and not strictly theirs. 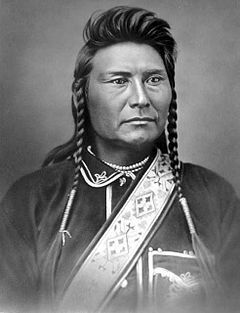 Chief Joseph himself once said that the concept of the individual ownership of land was foreign to his people and that “it was no man’s business to divide it” as the Euro-Americans were doing. Essentially, Euro-Americans appeared to be mad for gold and lucre to Native peoples already here on the land. Historian and social activist Howard Zinn has written that Western Civilization was at its root acquisitive—that is resources were to be exploited for individual gain. Things were more important than people and the planet on which we live. This is not to say that Western Civilization has nothing to give us. The rule of law so central in the Mukwonago Logo Case is chief among them. With that is government that is republican (small r) in character and democratic, (small d). If the fish, and wildlife, and the purity of Lake Superior is compromised, will the Apostle Islands continue to be such an attraction for boaters, fisherman, and tourists each year in Wisconsin? Will our State’s reputation as such an attraction for people who love the outdoors be damaged? It seems here we are cutting off our environmental noses despite our faces. The wisdom of great elders does not fit at all with what is being done in Mukwonago and the Penokee Hills. It runs completely contrary to the advice they give us. The Wisconsin Tribal Council and the Native-American residents of the area have been fighting to protect mother Earth from despoliation. Even the Euro-American religious teachings behind Christianity place all people in the relation of stewards of God’s creation. Mother or God himself is watching and noting our stewardship of these resources. The Nature Conservancy has stated that the Penokee Mine Project will be “catastrophic” to Wisconsin’s environment. It will damage wildlife and the very pure waters of this region. The value of extracting such a small bit of ore from the mine when measured against the environmental damage to be accrued does not justify the project. Let us hear Chief Joseph and the Oneida Woman Barbara Munson when they speak to us. Let us open our hearts and hear each other as if for the first time as people of mother earth entitled to the equal but wise use of what has been entrusted to us as good stewards of the waters, the lands, the animals and plants, and the very air we all breathe together. How far away some members of the Mukwonago community have wandered from these things when they continue to defy the law and to in anger shut out the voice of Native people who have been speaking to them about the hurt and lack of understanding represented in the Mukwonago School Board’s policies on the Mukwonago Indian nickname and logo. The backdrop to it all is race. It is that inability to open our hearts and to hear, feel, and see others as if for the first time in equality and true brotherhood and sisterhood. This entry was posted in Community and Citizen Action, Education, Essays, National Affairs, Race, The Faith Community and tagged Chief Joseph, Equality, Human Brotherhood and Sisterhood, Love for one another, Mukwonago Logo, Penokee Hills Mine Project, Race, Racism, The Rule of law. Bookmark the permalink.